The Veterinary Teaching Hospital was established as the Livestock Hospital in 1912, and has ever since played a leading role in dairy cattle husbandry and livestock medical treatment in Japan. In 1964, it was newly built at the current location as the number one Livestock Hospital in asia; as time passed, a large renovation was conducted in 1994. In 2002, it changed from a facility affiliated with the Faculty of Veterinary Medicine to one affiliated with the Graduate School of Veterinary Medicine. In 2006, its name was changed from Livestock Hospital to Veterinary Teaching Hospital. Later, in year 2013, the hospital moved from its old facility to the new Veterinary Teaching Hospital facility. The new facility is fully equipped with 12 examination rooms, a counselling room, 5 operating theatres, a dental care unit, various diagnostic imaging facilities such as X-ray, ultrasound, CT and MRI, low- and high-energy radiation therapy room, a chemotherapy room, an endoscopy room, an intensive care unit (ICU), and many more. As the main hospital for the region, the Veterinary Teaching Hospital has been developed to meet its demands. Due to the fact that dogs and cats have become companion animals with longer lifespan, medical care for age-associated diseases (for example, chronic heart disease, digestive disorders, tumors, endocrine diseases, chronic skin diseases, etc) is becoming important. Diseases that require advanced surgical treatments have also been increasing, therefore the Veterinary Teaching Hospital plays an important role as a referral centre in the region. As a teaching hospital, it is used not only for clinical education of students, but also as a place of further education for practicing veterinarians as well as training veterinarians from overseas. Furthermore, the hospital is also utilized as a centre for clinical researches in many areas, such as the development of diagnostic techniques with advanced imaging modalities, genetic analysis for diseased genes, elucidiating disease pathogenesis and developing novel therapies based on those findings, anti-tumor therapeutic methods with less burden on the patient, establishing guidelines and counter-measures for prevention of disease outbreak, and much more. 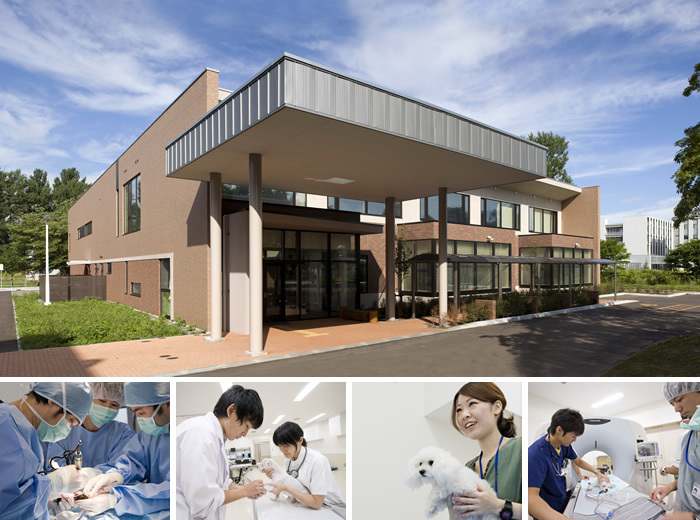 The Veterinary Teaching Hospital of Hokkaido University is an educational and research facility under the Faculty of Veterinary Medicine and the Graduate School of Veterinary Medicine, Hokkaido University. The target animals for veterinary clinical education and research are companion animals such as dog and cats, livestock animals such as cattle, horses, pigs, and chickens, various zoo animals and aquarium exhibits, and the many wildlife animals that inhabit the nature of Hokkaido. Striving for a hamonious coexistance between animals and humans, is it important for the Veterinary Teaching Hospital to train veterinary personnels with an inquisitive mind and scientific curiosity. There is also a need for the facility to offer sophisticated, reliable and comprehensive veterinary services. Therefore, we are in the process of establishing a veterinary medical system and improving the equipments to achieve these goals, based on our fundamental principles. Which contributes to the welfare of animals and peace of mind to pet-owners. Copyright © Hokkaido University Veterinary Teaching Hospital. All Rights Reserved.